Animal proteins with high biological value provide all essential amino acids which the body cannot synthesize by itself. 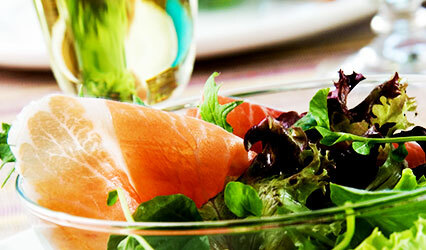 Fatty acids, including oleic acid, which helps to improve the levels of bad cholesterol (LDL). B-complex vitamins (B1, B3 and B6), which are fundamental for our body to work correctly and help to prevent cardiovascular disease. Minerals: calcium, sodium, phosphorous, zinc and iron. Serrano ham is a healthy food with low caloric value that can be habitually incorporated into healthy low-calorie diets. 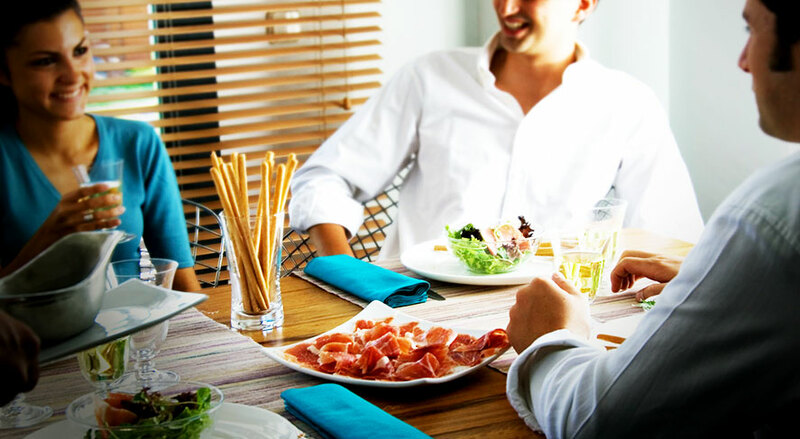 For years, the Mediterranean diet has exalted Serrano ham as a fundamental source of proteins, vitamins, minerals and non-saturated fats. The art of its elaboration, curing and maturation is studied and valued by international nutritionists and professionals specializing in Spanish and Mediterranean cuisine. It prevents cardiovascular illnesses as it contains B6 and oleic acid. It possesses high B-complex vitamin content (vitamin B1, vitamin B2, vitamin B3, vitamin B6) and vitamin D. Consumption of Serrano ham contributes to stress and depression management due to its high B1 content. It improves cholesterol levels as it contains non-saturated fatty acids. Serrano ham is a healthy food rich in fatty acids, especially oleic acid, which helps to improve LDL cholesterol (bad cholesterol) and HDL cholesterol (good cholesterol) levels. Half of Serrano ham fats tend to be unsaturated, and as such protect the heart. Its properties are similar to those of olive oil: it can contain fat-soluble vitamins and gives flavour and aroma to food. It is a natural source of minerals such as iron, phosphorus and zinc. Thanks to its high iron content, this ham can be the perfect ally in preventing osteoporosis. In addition, its zinc content improves attention span, comprehension and retention. It is easy to digest, containing a reduced level of collagen due to the meat maturation process and protease activity (enzymes that fragment proteins into amino acids), and as such our digestive system can more easily break down amino acids. Nitrites and nitrates are preservatives added to all cured ham during the salting process in order to control microbial development and guarantee microbiological safety for the consumer. In addition, they emphasize the flavour and colour of cured products. The levels of nitrites in cured hams are highly regulated by European authorities: the maximum amount of nitrates is 150 ppm, which is what is necessary to maintain microbiological safety and organoleptic benefits. As a result, it can be said the Serrano ham is one of the healthiest red meats in existence, as much due to its origin as its elaboration, which does not involve cooking, frying or smoking. “Bayonne Ham” as well as Prosciutto di Parma and San Daniele have longer and more extended contact with salt, the original source of nitrates. With Serrano ham, this contact does not exceed 15 days; however, in other hams it can be prolonged up to 30 days. In the case of Black Forest Ham, the salting process is accompanied by a smoking process which is a factor that increases the problem of nitrosamines. The report published in 2015 by the WHO on red meat notes that the elements to be monitored are heme iron, chemical compounds such as N-nitroso (nitrosamines), and aromatic hydrocarbons. But not all red meats are the same: for example, the fat from ruminant animals (such as beefs or cows) is much richer in saturated fatty acids than the fat from pigs. In addition, in the case of Serrano ham, there are some minerals such as, for example, zinc, which is present in Serrano ham, that help to counteract the excess of iron. With respect to nitrosamines, this are mostly produced at high temperatures (cooked or fried meat); smoking also increases the presence of nitrosamines in the meat. Due to the above, and due to the natural maturing process, natural cured meats such as Serrano ham accumulate less nitrosamines than other red meats.